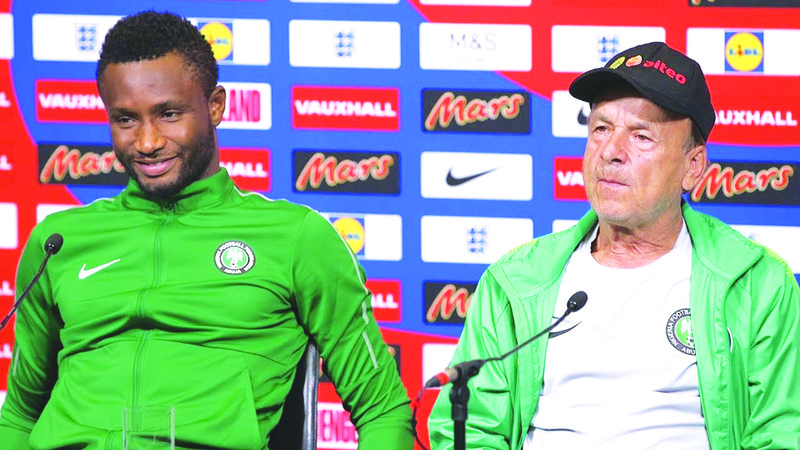 Nigeria coach Gernot Rohr says his team will be happy to welcome John Obi Mikel back and hopes the Super Eagles captain can help the 3-time champions win a fourth Africa Cup of Nations title in Egypt in July. The 31-year-old, who is yet to feature for Nigeria since the 2018 World Cup in Russia, last month, completed a short-term move to English Championship side, Middlesbrough after terminating his contract with Chinese topflight outfit, Tianjin Teda. “Oh, we are very happy that our captain (Mikel Obi) is now in a good club (Middlesbrough) and I hope that he will play very often to find the rhythm again,” the former Burkina Faso and Gabon coach said. However, Rohr maintained that Mikel would have to be ‘very fit’ and ‘playing well’ for Boro to make a return to the Eagles. “He has to be very fit but I think he will work on it. And if he is playing well for the club, it is like that for the other players who want to play with us; who have the motivation to come with us, they have to do well in the club, and then there is a chance to comeback. “We would be happy to see him back, and I think it could be a wonderful dream for Obi Mikel to come and to win the AFCON with Nigeria,” the 65-year-old concluded. Nigeria will know their 2019 AFCON foes on 12 April when the draws for the competition will be staged in the Egyptian capital, Cairo.